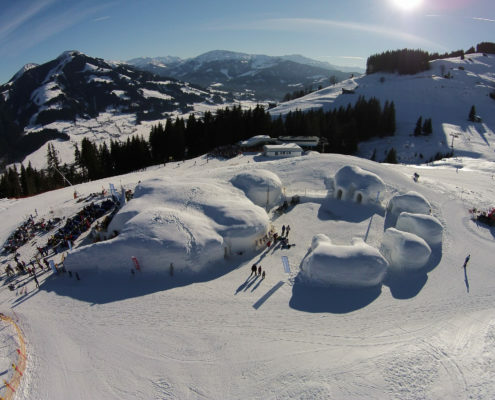 When the last skiers leave the mountains of the ski resort SkiWelt Wilder KaiserBrixental, the ALPENIGLU® guests dive into a world of incomparable silence that spreads out in the igloo village. The adventure begins! A night in one of the seven private VIP igloo suites is an outstanding experience: it is a romantic accommodation for some guests, and a once-in-a-lifetime experience for others. Overnight guests book an all inclusive arrangement that combines luxury and adventure on a high level. 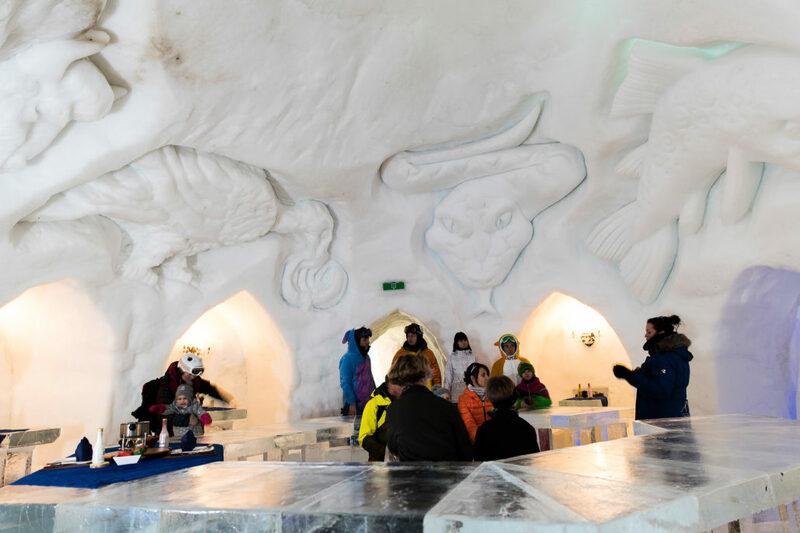 A cool drink at the ALPENIGLU® ice bar and a delicious dinner at the ice table are just some highlights of your night at the ALPENIGLU® village. Enjoy a meat fondue at a table made of crystal clear ice! 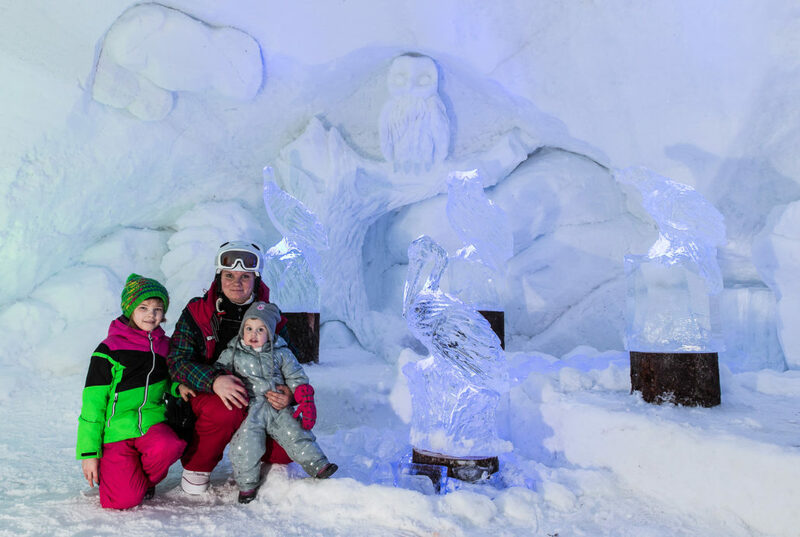 An attractive active programme completes your stay: carve your own ice sculpture under the supervision of your professional guide and enjoy a guided tour through our ice sculpture exhibition ICE LAND. 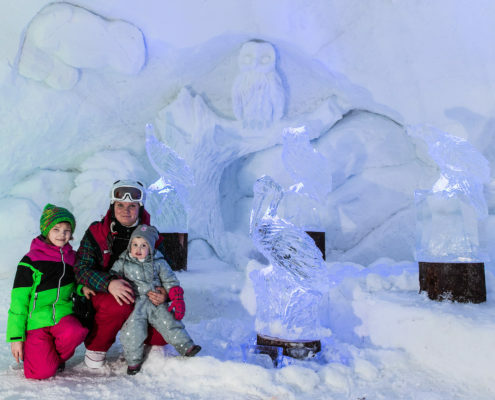 Complete your stay at the igloos, with a nightly torch walk through the winter forest under the stars. Afterwards we finish the evening with a get-together around a romantic bonfire. 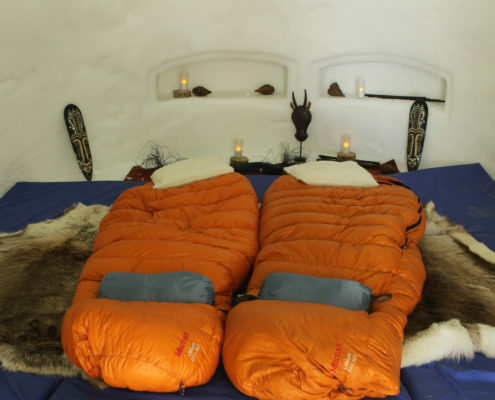 Finally you can enjoy the night in your own igloo suite, with a cosy warm sleeping bag, a high quality snow-proof mattress and comfortable reindeer hide. Under the white snow roof in the peaceful silence of your igloo suite, sweet dreams are guaranteed and your igloo night will be an unforgettable experience! After that spectacular night, you can enjoy a tasty breakfast at the near-by mountain restaurant before you start your homeward journey. Group bookings possible, enquiries necessary (min. 8 people), max. group size: 28 people. Our general terms and conditions apply for bookings. The special experience for couples! Enjoy your dinner at your own private and special decorated “table for two”. The romantic light and the glittering walls will put you into a wonderful mood. Prosecco and a bottle of wine are included. Enjoy the spirit of the night! 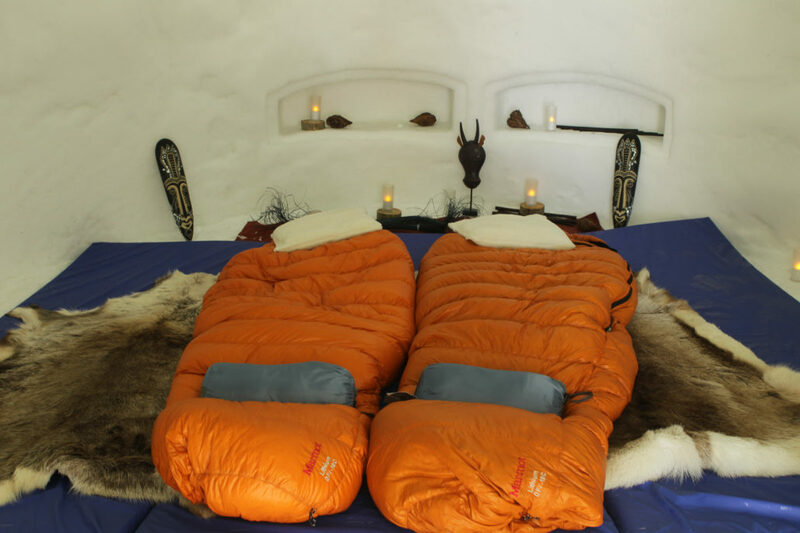 You want to give the overnight stay in an igloo as a nice present to somebody? To make it even more special you can book the “Birthday Special“ package. With igloo cake, Prosecco, birthday decoration and table fireworks you offer a great surprise for the birthday boy/girl. Surprise your partner with an ice cold bottle of champagne. The (0,37 l) bottle and glasses are already waiting for you when you check in your igloo suite. Cheers! Have an unforgettable igloo night. Before your igloo adventure starts you can explore the winter forest with a snowshoe treasure hunt in the afternoon. 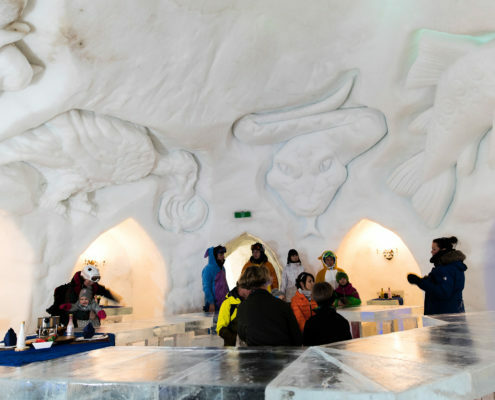 In the ice bar igloo you get your treasure map, your snowshoes and a little briefing. After that it is time to start your excursion into the snowy winter wonderland on your own. On your way you will find a possibility to stop for a nice coffee and cake in a cosy mountain hut (not included). 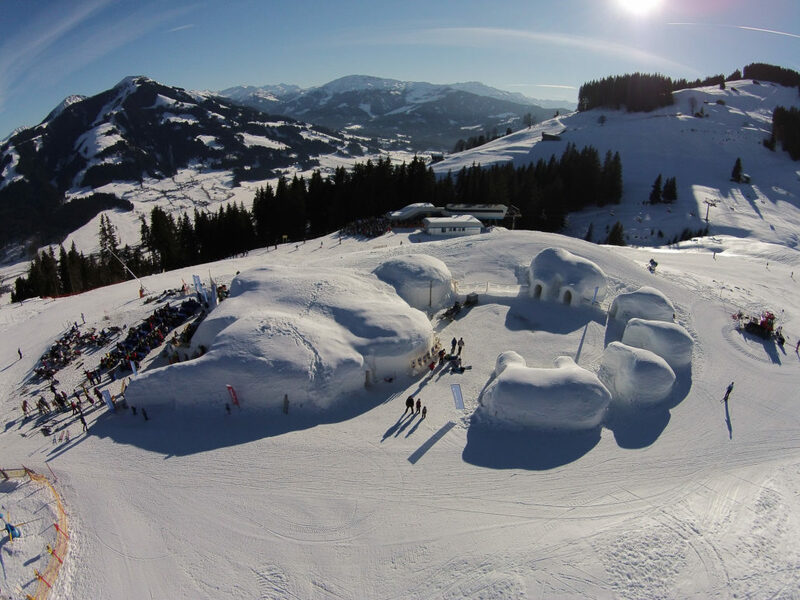 If you follow the right track and find the treasure you will get a very special reward back in the ALPENIGLU® village: a cocktail from a glass made of real ice.